TOKYO, Japan, August 28, 2014—Renesas Electronics Corporation announced the availability of its R-Car V2H, the company’s newest system-on-a-chip (SoC) implementing state-of-the-art image recognition technology to support high-resolution surround viewing in advanced driver assistance systems (ADAS). This is the first R-Car ADAS device from Renesas and includes additional functionality for higher performance, lower power, and improved safety in traditional and emerging self-driving vehicles. Renesas applied technology from its industry-leading R-Car SoCs for automotive infotainment equipment and added high-performance image recognition and low-power consumption technologies in the development of the R-Car V2H. The R-Car V2H enables embedded system manufacturers to deliver high-resolution surround-view monitoring systems, with multiple cameras, for advanced point-of-view switching. This includes rear-view and surround-view capabilities that expand what is seen by the system to every direction around the vehicle, aiding in driver oversight prevention. These types of sophisticated systems demand substantially higher processing performance in order to handle the expanded range of image recognition targets and increased processing load imposed by multiple cameras with higher pixel counts. At the same time, there is demand for both functional safety, to maintain high quality and performance, and reduced power consumption. Finally, the rapidly increasing cost of software development creates a need for better development efficiency. The Renesas R-Car V2H addresses all of these requirements in a single-chip solution. The R-Car V2H SoC incorporates the IMR, a core dedicated to viewpoint conversion d, the Renesas IMP-X4 image recognition core, and a 3-D graphics core, all of which provide the imaging-related technologies needed to support ADAS requirements on vehicles targeting new government regulations and insurance safety ratings. The overall architecture of the R-Car V2H is optimized in order to reduce memory bandwidth usage and overall latency. Six IMR channels can each support a high-resolution camera where the combined output can produce high-definition surround view images. The IMP-X4, in combination with the CPU, offers high performance for real-time processing of image data as it is captured from the camera. The 3-D graphics core enables a human-machine interface (HMI) that can deliver high visibility and easy identification of hazards and is optimized to support texture mapping from the camera feeds. While integrating the above functionality on a single chip, the R-Car V2H device also incorporates functions to reduce power consumption to the levels required by automotive systems. This includes a system design that balances performance and power consumption, a power cutoff function for the integrated cores, and a DDR3-SDRAM power backup function. 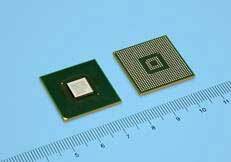 The IMP-X4 image recognition core delivers image recognition processing performance that is approximately eight times that of the earlier Renesas SH7766 and approximately four times that of the R-Car H1. The IMP-X4 incorporates six programmable image processing accelerators making possible image recognition functionality involving, for example, processing of input from multiple cameras, while altering their configuration as needed. The Renesas exclusive image recognition library support has been expanded to include an open source library (OpenCV), substantially increasing the efficiency of software development for the customer. The image recognition library does not require fine tuning to extract full performance from the image recognition core, delivering consistently stable performance and allowing for smooth software upgrades. In addition, the library is backward compatible with the IMP series employed in the earlier R-Car H1 and SH7766 Renesas products, making it easy to reuse existing software resources. Ethernet AVB offers features such as guaranteed bandwidth and synchronization of multiple cameras. Moving forward, it is expected to become the mainstream technology for automotive high-speed networking. The R-CAR V2H includes a gigabit Ethernet AVB controller to work with next-generation automotive networks. In combination of the introduction of the Ethernet AVB technology with optimized features for multiple-camera reception, Renesas also integrated multiple-channel video codecs supporting up to 5 high resolution cameras in parallel. In order to support technicaltransition processing of video codecs for surround view monitoring systems, R-Car V2H supports MJPEG & H.264. Based on long experience in functional safety for embedded systems, the R-Car V2H has been designed to achieve high level functional safety. For example, ECC has been implemented on external memory and CPU caches in order to support system manufacturers’ safety concepts. Additionally, the hardware CRC functionality makes it easy to achieve end-to-end protection of data transfers. In addition, the early adoption of the highly reliable INTEGRITY® real-time OS from Green Hills Software is an important step toward achieving functional safety in both hardware and software. Samples of the R-Car V2H SoC will be available in September 2014. Mass production is scheduled to begin in October 2016, and is expected to reach a combined production volume of 500,000 units per month by October 2017. An open source computer vision and machine learning software library. This wide-ranging library can be used free of charge, and it has been widely adopted for the development of image recognition programs on the PC.